The chairman of one of the largest U.S. nuclear companies recently said that his company would not break ground on a new nuclear plant in the United States until the price of natural gas was more than double today’s level and carbon emissions cost $25 of ton. This seems to pretty well summarize the current prospects for U.S. nuclear power. This paper by Lucas W. Davis (Haas School of Business UC Berkeley) is an excellent summary of the US situation as of 2011, and a good source of references for your research on nuclear construction costs. Davis is not attempting to predict the future; he is drawing inferences from the historical data. That is a depressing picture — with the 2011 evidence indicating that US nuclear suppliers have not learned even the French lessons. Many within the nuclear industry claim that the industry is headed more toward the French model. A chairman of a major nuclear power company recently reported that new reactors would be standardized down to “the carpeting and wallpaper”. However, this claim does not appear to be supported by the license applications that have been received to date. Among the 17 applications that have been received by the NRC, there is a mix of both pressurized water reactors and boiling water reactors, manufactured by five different reactor manufacturers (Areva, Westinghouse, Mitsubishi, GE-Hitachi, and GE). Thus, it may well be the case that the industry will soon coalesce around a very small number of designs, but this is not immediately obvious based on these initial applications. At a minimum it seems clear that the French approach of supporting a single reactor design is not going to be adopted here. Will China lead the world out of this pit by creating a mass manufacturing supply chain for a manageable number of standard designs? 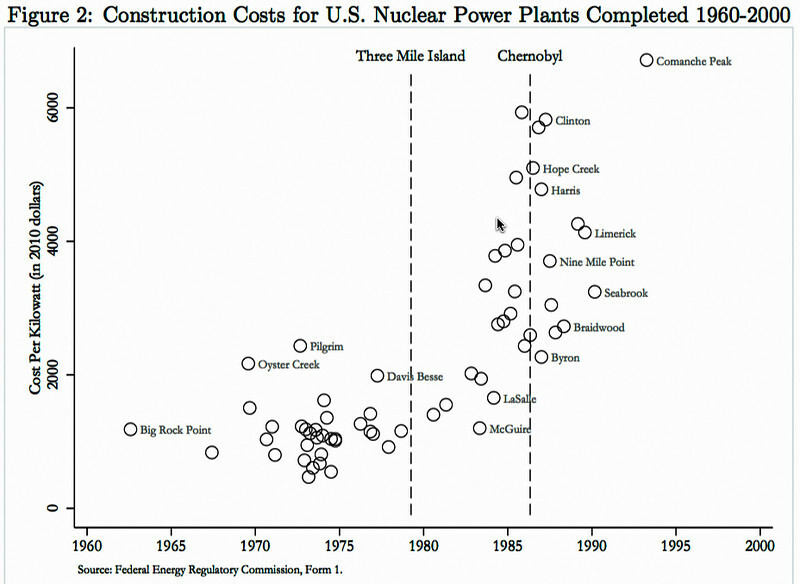 This entry was posted in Energy Policy, Nuclear Costs, Nuclear Power by Steve Darden. Bookmark the permalink.